Somehow my countdown to my first Ironman is flying by! Probably faster than I’d like it to. My blogging has suffered with the increase in schedule commitments on my calendar, but, for the most part, training is going well and I am excited for what the next 100 days brings. This spring has been an especially busy one for my family with both kids in activities, we’ve had commitments 5 nights a week for the last two months. There’s no sugar coating it, there have been days where I just haven’t felt like getting a workout in. In the past where I would begin to skip workouts I would make a habit of it and I’ve not yet let myself skip a majority of workouts so I guess that’s positive. As my kids’ spring activities wind down, I expect that I will have some additional hours to train, which is perfect timing because I really need to be increasing those! In thinking about my event 100 days from now, I decided to do a check-in with my progress in each sport. Swim- I’m feeling a lot smoother in the pool. My swims have been 2000-2500 for a few months now and I’m pretty comfortable with that. One fun development from swimming, I have arm muscles (quite small ones, but still!) for the first time ever. I’m really enjoying my swim workouts and feeling quite a bit stronger in the pool than I did last year when training for my 70.3. Bike- Since I’ve never ridden through the winter before I don’t have a lot to compare it to, but my bike speed is where it was at the end of last season and I’m riding longer distances too. 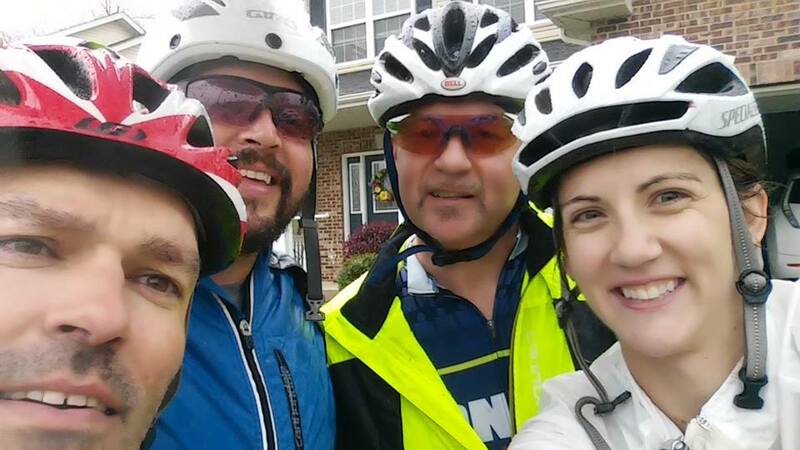 I’ve had the opportunity to bike with a small group from my ti-club a few times, as well as a couple individuals over the last few months. Cycling is so fun to me because you can explore so much more in a few hours than you can with running. I live in the middle of nowhere and really enjoy riding on “my” country roads. On a long ride a few weeks ago, I kept count for the first couple hours and I had passed more cemeteries than I had cars. This past weekend I had my longest ride ever, at 68 miles. It went really well despite some rain and was a good confidence boost. 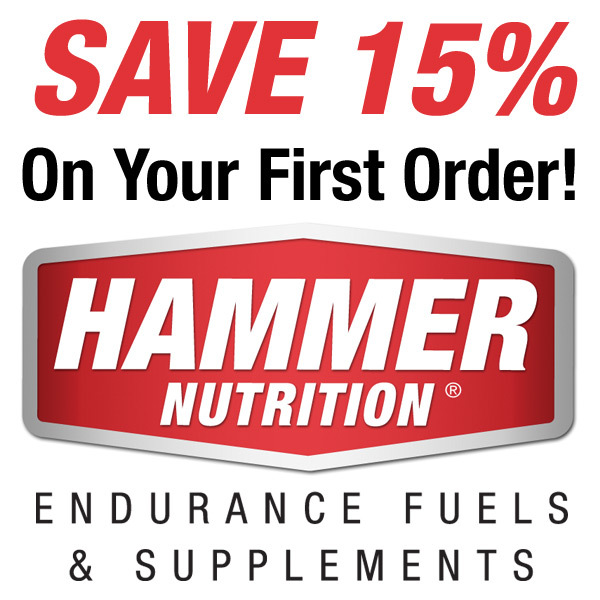 I’ve also been playing with nutrition and really loved how much Hammer Perpetuum helped with that long effort. It made a huge difference in my energy and I didn’t really bonk. My biggest need in the next couple months is just more time on the bike and getting used to longer rides. My only complaint on long rides so far is becoming saddle sore after a few hours. My body has to adjust to that eventually, right? Tri Club Group after our 68 mile ride, my longest ever! Run- Although I started running in 2008, I’ve never been consistent. I’ve always had to have a race on my calendar to dangle the carrot to get me to run regularly. 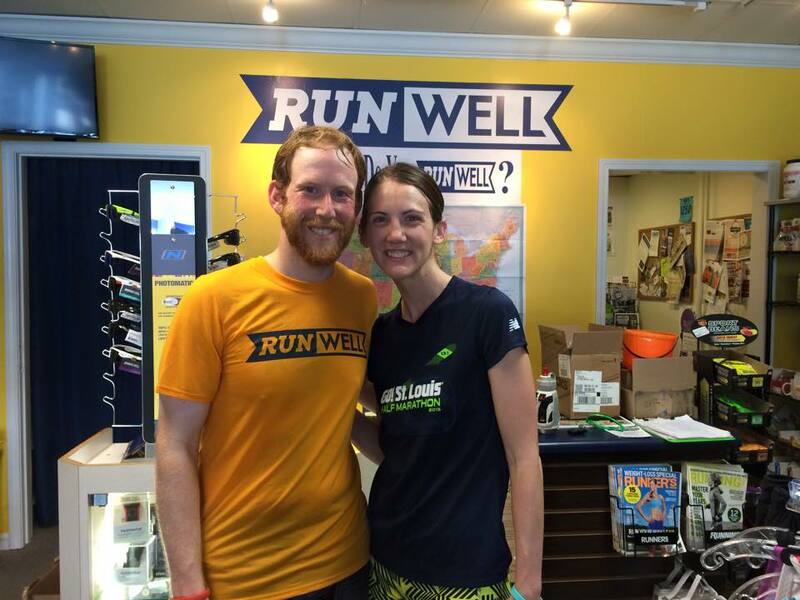 In 2014 I began running with groups through my local running store, Runwell, and that has helped my consistency a lot. Since October, I’ve had a double digit long run just about every week. I’m really hopeful that this will mean much better run experiences in my long triathlons this summer. In addition to weekly long runs and being consistent, I’ve seen progress with my run paces as well. 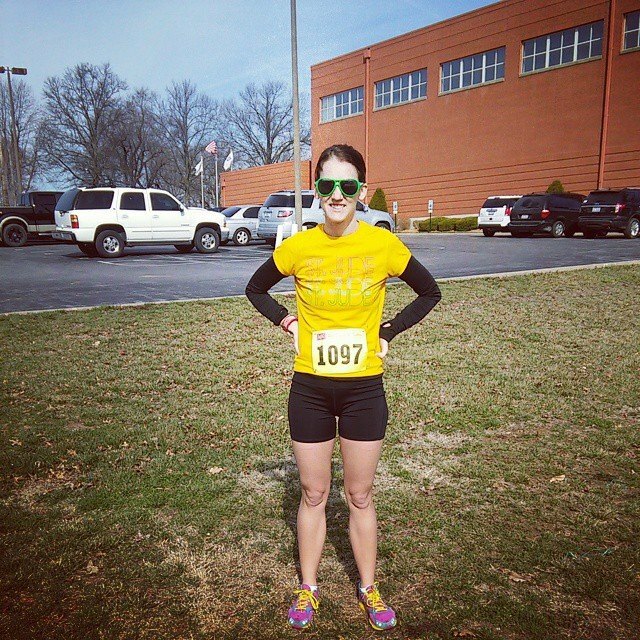 This spring I’ve set new PRs in a 10 mile race and a Half Marathon. My hope is that with some additional time to train I can add in some track and hill sessions to my run training. 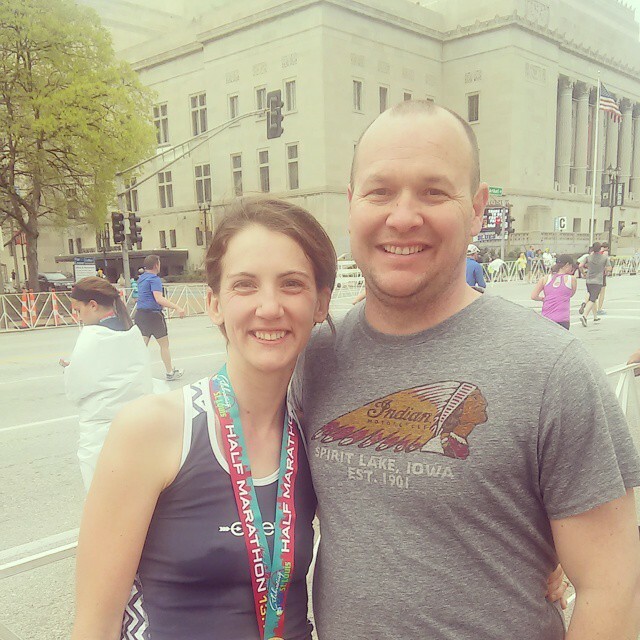 After my Half Marathon PR, with my wonderfully supportive better half. Overall, I’m feeling good about tackling 140.6 in 100 days. I’m really enjoying the training and especially the gains I’m making through my training. There’s a lot of work to be done between now and then, but I’m looking forward to it! I just love our Tri club. I just wish I could do more with everyone. Glad things are going well. When you start counting down by training weeks left things don’t seem far off at all. I have no idea how you juggle your life and have time to train. It takes all I can to go to work and maintain a running schedule. I can’t imagine adding kids and their activities on top of it all.